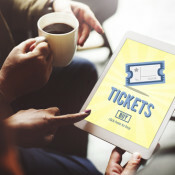 One of the things that caught our attention about the visitor marketing for CeBIT, which is expected to draw some 200,000 attendees to the Hannover fairgrounds next month, is their new ticket pricing strategy. The giant tech trade show is running a four phase, time-centric variable pricing program, with an 8x delta between the lowest and highest prices, which has created substantial incentives to buy tickets early for the 2018 edition. Phase 1, called “Discover Ticket”, is 25 euro. Phase 2, called “Pioneer Ticket”, is 50 euro. Phase 3, called Impulse Ticket, is 100 euro. Phase 4, called “Just In Time Ticket”, is 200 euro. The show organizer employed a very long runway for this variable pricing program — presales started in June 2017, one year before this year’s upcoming show, and ticket prices have been increasing according to a “time-graduated scale” as the organizer put it in their press release. Phase 1 ran from June through August 15, 2017. Phase 2 ran until October 31, 2017. Phase 3, which we are currently in, runs until May 27, 2018. Phase 4 runs from May 28 until registration closes. The variable pricing has been heavily promoted via multiple channels, especially email. For example, the very aggressively priced phase 1 offer was promoted in five separate emails, and at the “subject line” level in the fifth email. In addition to this media weight, the variable pricing is also being supported with substantial creative weight – it has been hard to miss the prominent messaging here. Robust content blocks, urgency focused copy, font sizes similar to that of the primary email content and eye-catching graphics have emphasized the significant savings and time sensitivity of the special ticket prices. Variable pricing can certainly help you capitalize on elastic demand curves where a change in price affects ticket purchases but make sure you realize full value from this tactic by leveraging all execution factors: pricing, time windows, promotion, etc.